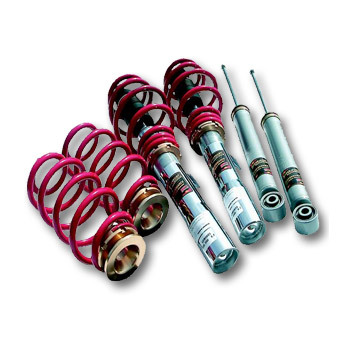 We are Supersport�s biggest UK dealer for their superb range of height adjustable Pro Coilovers which is also our number one selling VW Coilover system! Superb build quality and massive height adjustment combined with our excellent discount prices is an attractive offer for any true car enthusiast! These kits are made in Supersport�s own purpose built factory and are German TUV Quality approved. All kits are supplied built up in the box so all you have to do is fit your top mounts and they are ready to go on your car! Our biggest selling budget Coilover kit!